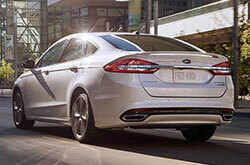 What's New with the Ford Fusion? The 2017 Ford Fusion is getting a host of fantastic upgrades this model year, giving it a nice refresh that should help continue its place as a leading midsize sedan. 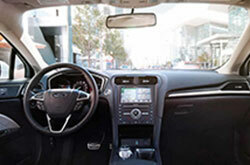 Among the many upgrades available on the Fusion is the newest version of the Sync 3 infotainment system, as well as a redesigned front fascia, a new ultra-luxurious Platinum trim and a new V6 Sport model. Continue reading our full 2017 Ford Fusion review below to learn more about this fan-favorite family sedan. The 2017 Ford Fusion near Dallas is a midsize sedan that comes in five trim levels, as well as two alternative-power models (Fusion Hybrid and Fusion Energi plug-in hybrid). Standard features on the sedan include 16-inch alloy wheels, a rearview camera, Bluetooth connectivity, a four-speaker sound system and LED taillights, just to name a few. Move up to the higher trims and you'll add such luxury features as LED daytime running lights, satellite radio, a rear spoiler, ambient interior lighting, HD radio and larger wheels. 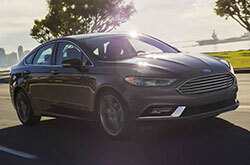 The two newest trims on the 2017 Fusion offer such features as upgraded leather seating and a unique grille insert (Platinum trim), and a turbocharged V6 engine, quad exhaust tips, adjustable suspension dampers and a different grille (V6 Sport). There are multiple powertrain options on the 2017 Ford Fusion in Grapevine, including a 2.5-liter four-cylinder, which is available on the Fusion S. The Fusion SE also gets the 2.5L four, as well as a turbocharged 1.5L four and a turbocharged 2.0L four. The latter is the standard powertrain on both the Titanium and Platinum trims, while the new V6 Sport comes with the previously mentioned turbocharged 2.7-liter V6. A six-speed automatic transmission comes standard on all models. As a leading family sedan in the Dallas area, many 2017 Ford Fusion reviews have called out the car's impressive list of standard safety features that includes everything from antilock brakes and side curtain airbags to front seat side airbags and traction and stability control. 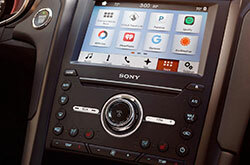 Drivers will also find Ford Sync, which comes with such amenities as emergency crash notification. Discover even more details about the 2017 Ford Fusion by stopping by Grapevine Ford and taking the Fusion for a test drive! When searching for new vehicle models in the Dallas metro area, you may have seen the 2017 Toyota Camry, Nissan Altima, Honda Accord, Hyundai Sonata and the Kia Optima, but the 2017 Ford Fusion is also a phenomenal option. 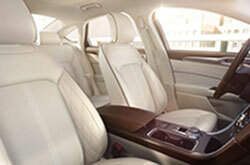 Offering an exciting personality and premium in-car technologies, it could be just what you need from a vehicle. After using our 2017 Ford Fusion review and compare page, view up-to-the-minute exclusive dealership offers online! 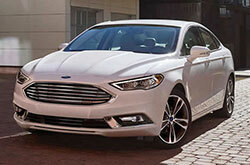 We're a neighborhood car dealer with many offers on new and quality used car models, including the Ford Fusion. It's imperative to make a discerning choice when selecting a car, and we hope our 2017 Ford Fusion review offers a helping hand when it comes to this. You are certain be impressed when you visit Grapevine Ford to test drive the Ford Fusion; we invite you to come experience the model up close. Also, preceding your visit, you can see its dapper cabin from all ends by viewing our video walk-around.